Deloraine is a town on the Meander River, in the central north of Tasmania, Australia. Eschew the tourist crowds and head to Montezuma Falls and The Low Head Lighthouse. 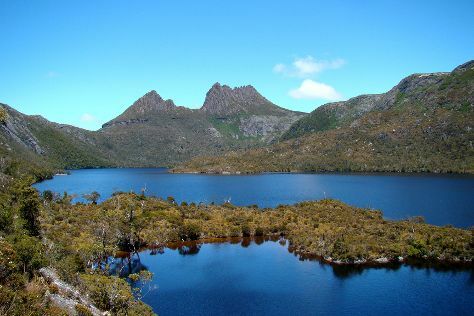 Venture out of the city with trips to Beaconsfield Mine & Heritage Centre (in Beaconsfield), Rowella (Iron Pot Bay Vineyard & Holm Oak Vineyards) and Cradle Mountain-Lake St. Clair National Park (Cradle Mountain, Dove Lake Circuit, & more). There's lots more to do: appreciate the history behind The Wall in the Wilderness, take in the exciting artwork at Deloraine Creative Studios, and snap pictures at Ross Bridge. To see maps, photos, other places to visit, and tourist information, read our Deloraine sightseeing planner . February in Deloraine sees daily highs of 28°C and lows of 13°C at night. Finish up your sightseeing early on the 22nd (Fri) so you can travel back home.